After long days of diwali break finally, my son’s school has started. Well during the vacation, we totally chilled out, eat and did something every other day but I was missing the routine. I was missing the me time that I get finally after these years. So at first day of school I was more excited then him. He was like, “whatever school” and I was like, “yeah school its going to be so much fun !” He gave me those looks as in – whats wrong with her, whats her problem. So when he went to school the first thing I did was took a nap, finally after days as there was no staff during holidays and my son constantly saying…………. “Mumma, where is the mop ? I want to mop the house.” Well that’s his latest hobby as more than cleaning, he makes a mess and a puddle. “Mumma, where are my markers ? I want to write my numbers.” And then if I dare take a 5 min nap,?we have markers on whatever he feels like to write – the walls, the floor, his cars and not to forget my newly bought denims. Unlike any other parents who constantly complain that their children watch way too much television, I requested him to watch his cartoons so atleast for 30 mins I can take a breather, but – ” no mumma, I am a big boy, I used to see TV when I was small now I dont like it” I wonder from where did he get this from but during the whole vacation he banned the TV and took to cycling which is a very good thing but any time of the day he wanted to go down and cycle and me or mr. Finally home for just 4 days had to go with him. Phew ! So finally after all this and more, he happily went to school on the first day that made me very happy. 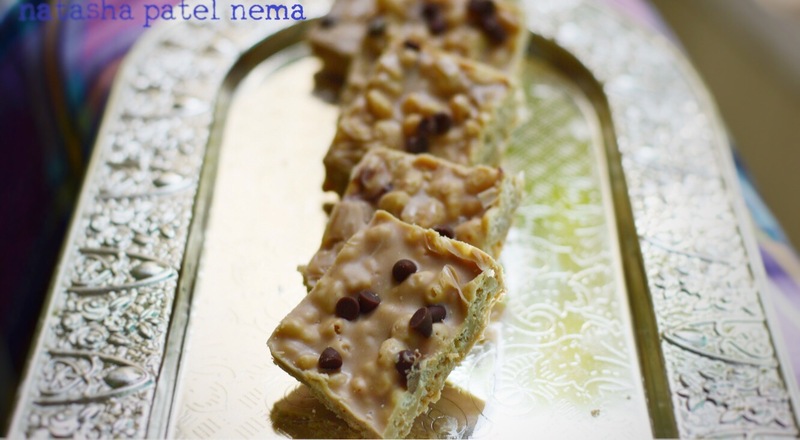 When he was off to school, I made this quick white chocolate crispies. My son is an extremely choosy eater so its always a doubt that he will eat or not, but to my surprise he really relished them and that was the icing on the cake. Once school starts the days end really fast as he slept off by 7 finally the cherry on the cake and I was free to get back to my project. Being a mother you are too much in touch with the feminine side of your self. Years back a wise man after knowing me for a while pointed out that I don’t have much of feminity in me, I did not take it as a negative comment. I agreeded and explained him that I like that part of me who loves cars or follows sports or plays pranks in school, bunk classes, follow my crush to his home. Yes, I have even done that too.. Ever since I became a mother, my major activities are feeding, bathing, cooking, putting my son to sleep, cleaning, taking out stains from his T shirts, grocerries etc etc and thus I haven’t been in touch with the alpha side of myself. Notice the background symphony orchestra in this scene, its creates such tension..and the play of shadows and lines and the camera work. Now the thing with fast and furious series is that I have grown up watching these movies thus I enjoy cars flying and crashing at the the end of the day. Every stunt you watch one knows this cannot be possible and yet the special effects, camera work, editing, sound,visuals they manage to show the speed and the tension which for some reason Bollywood action movies fail to do that thus in our movies everything is shown in show motion to cover up on their lack of technique. Eventually at the end of the day I only wanted to be entertained and nothing like good visuals and well filmed action scenes.